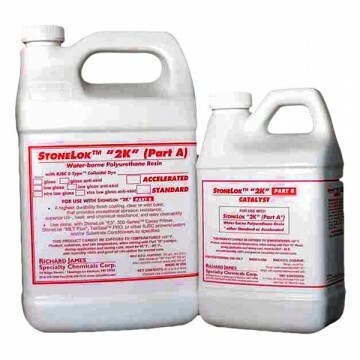 StoneLok™ E3/2K2 is a 3-part system rather than a single product. The concrete is first conditioned with a water based silane (O-S/W™), which promotes better bonding between the StoneLok™ E3 and the concrete. Application of the O-S/W™ amounts to wiping it on and letting it dry. StoneLok™ E3 (or just "E3″ for short) is a water based epoxy that serves as a stain barrier and as a "primer" coat that is applied to the concrete. The final step StoneLok™ 2K2 CT (or just "2K2" for short)is a water based urethane designed for concrete countertops that serves several functions. It is a stain barrier, a wear layer and it provides the sheen. StoneLok™ 2K2 CT comes in gloss, low gloss and an extra-low gloss version. It can be used indoors and outdoors. 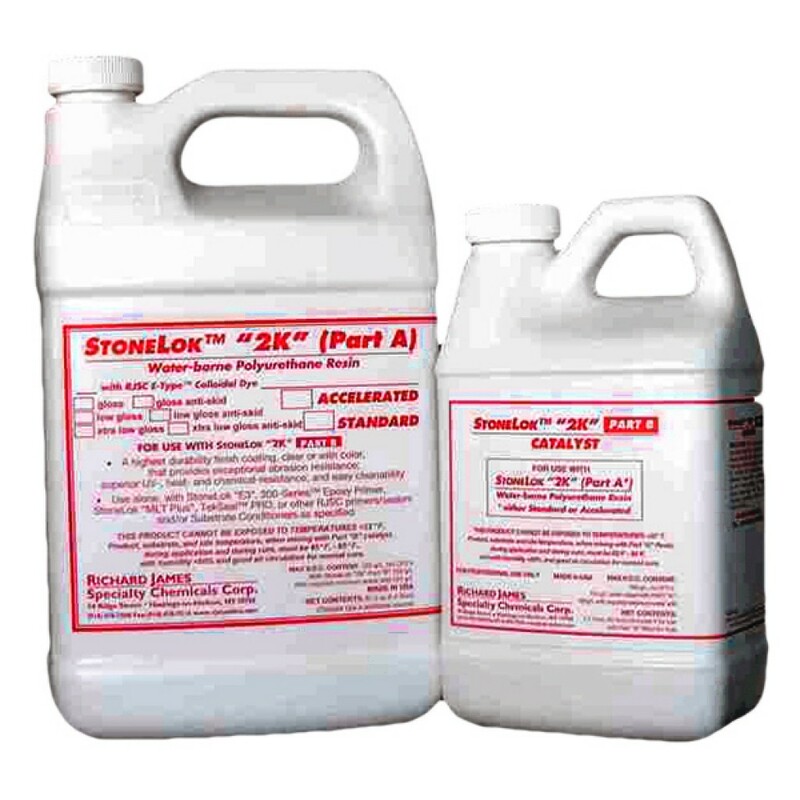 StoneLok™ E3/2K2 provides excellent stain protection and resists vinegar and lemon juice for at least 24 hours. Its CCI stain score ranges from 96% to 99%, depending upon the number of coats applied. StoneLok™ E3/2K2 has demonstrated great heat resistance, showing no damage to temperatures of around 450 degrees F. When applied correctly it bonds tenaciously to properly prepared concrete. E3 can be applied to non-dry concrete, although the concrete surface should be air dried and not appear wet or damp when applying the E3. StoneLok™ E3/2K2 is a complex sealing system. It is not a simple pour-and-wipe product. Careful measuring and disciplined adherence to the instructions are essential to performance and consistency. While it can be rolled on, best results come from spraying with an HVLP sprayer, and practice and patience are required. Generally one coat of E3 and one coat of 2K2 provide great results. Because it is a coating it is vulnerable to cuts and scratches. 2K2 is a tough finish that resists most scratches, but a sharp or rough heavy object dragged across the finish will scratch it (and just about all coatings for that matter). Repairs are not easy, in the sense that making the scratch disappear and achieving a perfect "like-new" look takes effort, skill and time. On site resealing may be necessary if a simple spot touch-up is not aesthetically acceptable. Approximately 400 square feet per Gallon when applied at correct wet thickness. This product cannot be allowed to freeze during shipping. Orders placed with FedEx Overnight Shipping are typically shipped out within 1 business day. Orders placed with FedEx 2 Day, FedEx Ground or FedEx Home Delivery will be shipped out when a safe shipping window arrives. Please contact us if you would like to update your shipping method or order.